Contemporary architecture, and the culture it reflects dependent as it is on fossil fuels, has contributed to the cause and necessity of a burgeoning green process that emerged over the past half century. 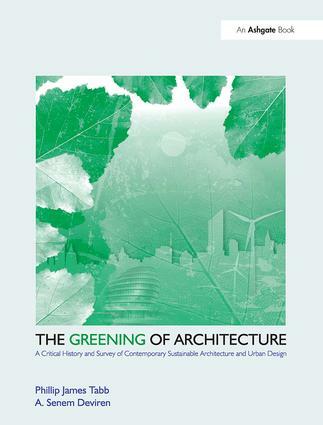 This text is the first to offer a comprehensive critical history and analysis of the greening of architecture through accumulative reduction of negative environmental effects caused by buildings, urban designs and settlements. Describing the progressive development of green architecture from 1960 to 2010, it illustrates how it is ever evolving and ameliorated through alterations in form, technology, materials and use and it examines different places worldwide that represent a diversity of cultural and climatic contexts. The book is divided into seven chapters: with an overview of the environmental issues and the nature of green architecture in response to them, followed by an historic perspective of the pioneering evolution of green technology and architectural integration over the past five decades, and finally, providing the intransigent and culturally pervasive current examples within a wide range of geographic territories. The greening of architecture is seen as an evolutionary process that is informed by significant world events, climate change, environmental theories, movements in architecture, technological innovations, and seminal works in architecture and planning throughout each decade over the past fifty years. This time period is bounded on one end by the awareness of environmental problems beginning in the 1960's, the influential texts by Rachel Carson, E.F. Schumacher, Buckminster Fuller and Steward Brand, and the impact of the OPEC Oil Embargo of 1973, and on the other end the pervasiveness of the necessary greening of architecture that includes, systemic reforms in architectural and urban design, land use planning, transportation, agriculture, and energy production found in the 2000's. The greening process moves from remediation to holistic models of architecture. Geographical landscapes give a global account of the greening process where some examples are parallel and sympathetic, and others are in clear contrast to one another with very individuated approaches. Certain events, like the Rio Summit in 1992 and Kyoto Protocol in 1997, and themes, such as the Hannover Principles in 2000, provide a dynamic ideological critique as well as a formal and technical discussion of the embodied and accumulative content of greening principles in architecture. Contents: Preface; Origins of green architecture; 1960s: an environmental awakening; 1970s: solar architecture; 1980s: postmodern green; 1990s: eco-technology; 2000s: sustainable pluralism; The global landscape of green architecture; Conclusion; Index. Phillip James Tabb is a Professor in the School of Architecture, Texas A&M University, USA and Dr A. Senem Deviren is an Associate Professor at the School of Architecture, Istanbul Technical University, Turkey.